Africa’s leading sports merchandise manufacturers AFA Sports launch Africa’s first Active footwear designed and engineered in Nigeria. As inscribed on its soles, the active wear shoes were designed to showcase the pride of Africa. The name “LIV (54)” represents the 54 countries on the African continent. “LIV (54)” is tailored and customized to the African physiology, kinetics and environment. It is lightweight and has the perfect combination of grip, comfort, durability & bounce. · Contoured Traction Grip (CTG) technology with advanced arch support and rubber outsole borrowed from the multi movement patterns of the Sahara dessert. · A micro mesh knit that gives the shoes comfort and breathability in warm climates. · Multi gel areas for force deflections. 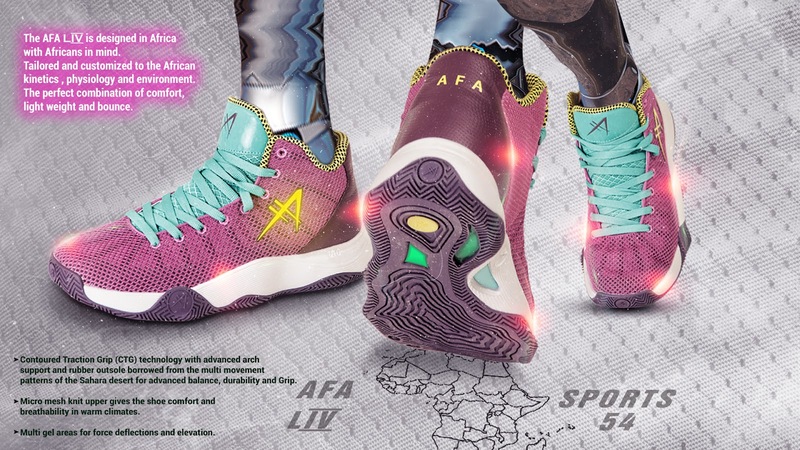 The AFA Sports 54’s can be worn to make a fashion statement or to elevate your basketball game. What does AFA Sport mean? The name AFA Sports means “Africa for Africa” and represents a concept that highlights Africa’s sports development and National pride. AFA sports was created as a sports merchandise brand for Africa to cater to grassroot sports that are neglected by the international brands who would rather not build from the ground up in an emerging market. What does AFA Sport represent? AFA Sports represents African sports and pride, it was established to showcase the pride & interest of the continent and this lays as the foundation of the brand. It was created to give the Nigerian & the African sports industry the attention and quality they deserve; by creating a range of products that have been adapted to the climate, kinetics and colors that are unique to African social context. The brand is committed to developing grassroot sports in Africa, this is the same way international companies such as Nike and Under Armour are American companies whose obligations and priorities will always be to where they were founded. Due to this AFA Sports studied Chinese brands such as ANTA, PEAK, LI-NING who were founded 10 years ago and now cater to the Chinese sports industry, this is the same model we have adopted to close certain gaps within the African sports industry, gaps which big sports brands have failed to understand and bridge during their time in the African market. What does AFA Sport mean for Africa? In the past 2 years AFA Sports have steadily been designing concepts that are unique to Africa, also creating a whole new market and industry that was non-existent and small scaled. By capitalizing on this untapped market, there has been creation of jobs and opportunities for Africa and also major investments in media and content development. The brand goal is to establish sports programs and encourage sports development in countries that are neglected and marginalized due to lack of investment. 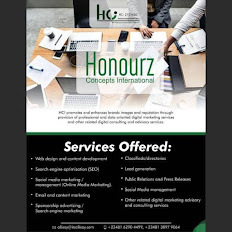 The goal is being achieved through several projects such as sponsoring the Nigerian Volley Ball Federation and the Benin Republic National Team. AFA sports is also currently working with the Liberian basketball federation to reinstate their program. AFA Sports also promotes grassroots basketball through our AFA Sports academy program in partnership with CBL Next for children aged 6 to 17 years, this is due to our understanding that sports is an essential contributor to a positive society. Our kids are taught on the importance of team work, good sportsmanship and character development. Why start with Nigerian National Team? Starting with the Nigerian National team was never the plan, the focus was initially to target the Continental Basketball League and the grassroots. However an opportunity arose when the National team were left without a kit sponsor weeks before the 2017 Afrobasket tournament. The Nigerian Basketball Federation tasked AFA Sports to put together a package for the national team. The AFA Sports team engineered customized fabrics and designs to ensure the National team had suitable kits made of the best products to compete in the Afrobasket tournament. What’s next for AFA Sports? AFA Sports is extensively investing in indigenous innovative collaborations aimed at driving local content. The challenge with this is finding the right collaborators and talent that fits, this includes designers, developers and technical expertise. In the summer of 2018 AFA Sports will be launching the biggest sports and athleisure Flagship store in Africa located in Victoria Island, Lagos. This will provide an opportunity for consumers to view an array of products and also physical connect and interact with the AFA brand.